Try Our "Which Legend of Zelda Weapon Fits You?" Quiz! Find out which weapon from The Legend Of Zelda's extensive armory best fits you! Calling all aspiring heroes! 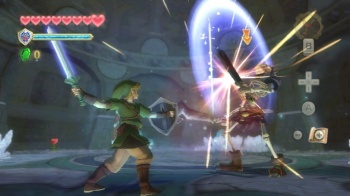 The Legend of Zelda: Skyward Sword hits the Wii this week, giving everyone the chance to once again overthrow evil while wielding the legendary Master Sword. Or perhaps using a trusty Bow. Or maybe using a few explosive Bombs? Since there's just too many choices, we've put together a quiz to help you figure out which item from Link's extensive arsenal fits you best. Choose wisely!